Saturday at the festival started out slow, but a great set by The Bowerbirds on the side stage ended up being one of the best performances of the weekend. The group was road-testing a bunch of material from their forthcoming record entitled Upper Air, and if the studio recordings sound as good as the songs do live, they've got another winner on their hands. 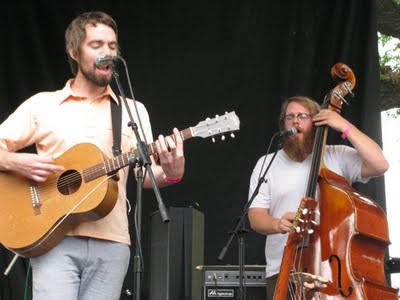 The group's folky sound and vocal harmonies shone through particularly well on their song "In Our Talons" from their superb debut record Hymns for a Dark Horse. With any luck, I'll get a chance to catch these guys on stage again sometime soon. I must admit that I was hesitantly excited for DOOM's set on Saturday. I know that he has a history of not even showing up to his own concerts and sending a doppleganger in his place to lip-sync, but I figured he'd be forced to make an appearance for an event as big as Pitchfork. 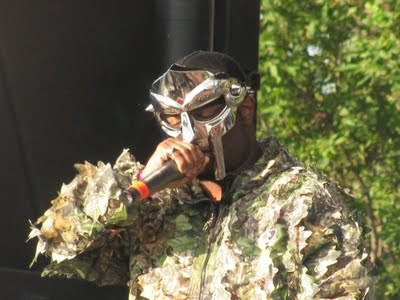 I didn't hear anyone crying foul, so I assume the real DOOM did show up, however his performance was lackluster at best. The vocal tracks to all his songs sounded pre-recorded, so odds are he was lip-syncing the entire show, although he probably didn't even have to move his mouth thanks to that big old mask. We got to hear tracks from a wide variety of his records, including The Mouse and the Mask, Take Me to Your Leader and Mm.. Food, as well as a few cuts off his newest album Born Like This. The most I can say is that it was an interesting experience, and if DOOM is to be believed, it's all about the music anyways. Saturday night's headlining performance by the National was one that why also really looking forward to. The group delivered in spades, playing a set that focused on material from their most recent release, 2007's Boxer. Live versions of "Fake Empire", "Mistaken for Strangers", "Squalor Victoria" and "Start A War" reminded me just how solid of a record Boxer was. The highlight of the set for me was a new song called "Blood Buzz Ohio" which I'm a fan of not only because it's a great tune, but also because of its references to my home state. The main set was capped off with an energetic and loose rendition of "Mr. November", buoyed by Matt Berninger's stage antics and screamed vocals. The band was just as good as I expected they would be live, putting on a show that proved them more than worthy of their headlining spot. 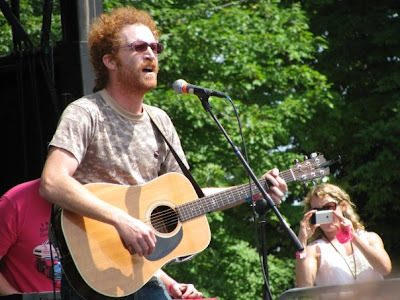 Blitzen Trapper was first on my list of bands to see on Sunday, I've really been enjoying their 2008 release Furr as of late. The group turned in the most straight-ahead rock and roll performance of the weekend, channeling influences that ranged from the Eagles to the Band. Equal attention was paid to the amformentioned Furr and 2007's Wild Mountain Nation throughout the set. I actually wasn't aware that the band was comprised of six guys, but they took full advantage of this manpower on just about every song. My favorite songs of the set were "Sleepytime in the Western World", "Wild Mountain Nation" and "Black River Killer". I had to sacrafice seeing the Walkmen and Grizzly Bear in order to get a prime spot for the Flaming Lips, but once the screen lit up and the confetti started to flow, it felt like the right decision. The Lips entered the stage in a way that looked like it was ripped straight out of a Spinal Tap show: they were birthed onto the stage by a giant glowing lady-part. Wayne really took the 'Write the Night' setlist to heart, making sure that the band played some songs that they didn't usually play. One of these was "Bad Days", which got my hopes up about a possible performance of "This Here Giraffe" although that ultimately didn't transpire. Another was a beautiful song from the Fearless Freaks soundtrack called "Enthusiam for Life", a song which Wayne said the band would likely never perform again. The group also made some time to debut a few songs from their forthcoming double album entitled Embryonic. The tracks they played sounds pretty weird and spacy, even for a band like the Lips, but pretty cool nonetheless. The rest of the set was pretty standard live Lips fare, but fun as hell. Had Wayne been a little less verbose, the band might have been able to squeeze in a few more songs, but everyone seemed to eat up his constant compliments to the crowd and the fest. Hearing ten of thousands of people sing along to "Do You Realize??" was a moment that I won't soon forget. My thoughts on the fest? Totally worth it, and I'll be back sometime soon.